Hope you all Have a Wonderful, Festive day & thanks so much for dropping in! This is such a cute image with those adorable poinsettia pots on the ground! I love your story of going to find your Christmas tree too. Those are the cherished memories that we carry with us our whole lives. Oh so cute! 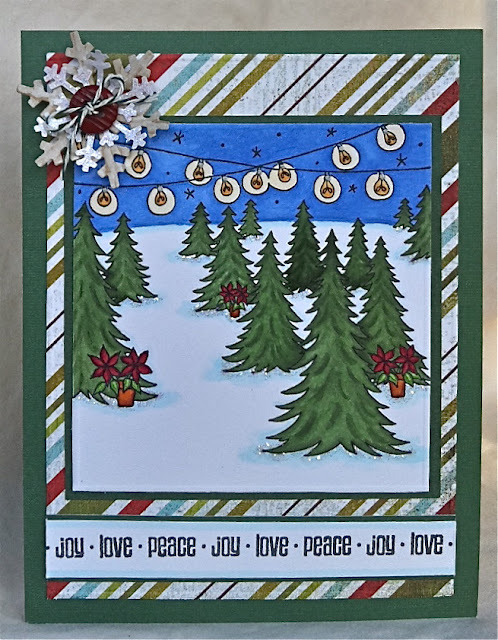 Love the image and it really does remind of the Christmas tree lot and how much fun it is picking out just the right tree! Hope you have a very merry Christmas Shannon and know you'll get to eat good with all the guys cooking! Have a good time. NO decorations yet?! LOL. And I thought I was running late. So sorry your husband has to work on Christmas, but sounds like you make the best of it. Have a wonderful Christmas! Wonderful card. It really expresses that Christmas feeling. are your decs all up now? Merry Christmas hunni, have a wonderful time at the fire station and wishing you a happy and healthy 2012. Wow! this is stunning Shannon! I love the scene that you've created. Your colouring is awesome and love the paper and delish snowflake. And it twinkles so prettily !! What a beautiful memory, going to cut down the tree. I have so many wonderful memories of Christmas too. My parents made it a really magical time. I should write them down! Hope you and your loved ones have a very Happy Christmas and New Year! How pretty! I love the colors, the DP you chose for behind it, and the wonderful snowflake you used for it too! If I am not back before then, a Very Merry Christmas and Happy Healthy New Year to you and yours!! love this Shannon! Just read the Charlie Brown Christmas book and it reminds me of the kids looking for their tree! Oooooh, love this one! IO stamps are some of my favorites! This is such a great Christmas scene and one we can all relate to. I love the lights strung over top and how you shaded and added sparkle at the base of the trees. I just love coming here. I always go away smiling! May Your Days Be Merry & Bright..